Note that this second survey was done to report on the Holi festival proper which fell on March 19th in 2000. Pranav Upasani positively contributed to this survey, particularly in the planning phase. Since he knew the region very well, he greatly encouraged the author to organise this study. 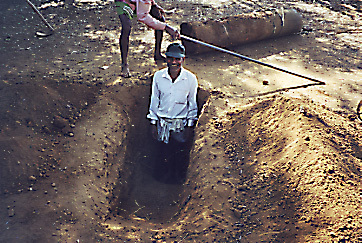 Note that, in contrast to the first survey the access to Hasne was from the south, from Kudal and Kankauli (see picture 1). For the characteristics of the village see the report of survey 1 (1997). Like in the first report the case of the village of Hasne was selected as an exemplaric representation of the whole survey. A CD-ROM containing the full results of the 100 villages surveyed will be produced later. Before the first ax stroke prayers are said and thanks are expressed with the 'namaste' gesture. All men shout loudly in 'whooo-whooo' manner, using their hands as an intermittant cover over their mouths. At the same time drums are beaten wildly for about 3 minutes. Then the tree is cut down by two men within about 10 minutes. The tree is considered a deity and while all the men pull it out of the woods into an open surface near a large tree, they all shout 'Holi-deo, holi-deo'! Then the long pole is lifted up on the upper side. Its upper part is cut partially. Bamboo poles are added for more height. The whole tree is prepared for being carried to the village. Lianas are wound around the heavy trunk. Wooden sticks are used for carrying the weight on the men's shoulders. Finally the tree is carried to the village in the framework of a dynamic procession headed by drums and wind instruments. From time to time the group gets exhausted and takes a little rest. The procession passes through the dry paddy fields of this widely stretched plateau. The large stump of the last year's pole is dug out and the hole is prepared for the new pole. Another working group prepares fibrous materials for binding the mango leaves onto the pole and to fabricate the white and shiny symbols at the top. The material is taken from the bark of a special tree. The material is called 'khaushi'. Heaps of mango leaves and twigs are brought to the place and deposited near the Holi pole. It has now been lifted on the upper side and supported by a cross of two wooden poles to facilitate the clothing work with mango. In March the heat is quite considerable in this region and the paddy fields are exposed to the full heat of the sun. In contrast to this the working groups feel very well in the shady Chauhatta. Digging holes into the earth for architectural elements which are positioned into them and stabilised by stones and earth is doubtless one of the most ancient techniques to give a building or a tectonic element stability. Coating the pole with mango twigs and leaves is the work of a special group. Partly lianas are used to fix the mango twigs and leaves, partly the 'khausi' fibres serve this purpose. Coating the Holi pole with mango leaves and twigs is a very stereotype practice in southern Maharashtra, whereas the selected tree species can vary considerably. Whether this surprising homogeneity corresponds to a particular diffusion, or whether it has other reasons, could not be clarified. Initially it was also assumed that in the upper part twigs and branches might point upwards, whereas in the lower part they would hang down, expressing some sort of polar relation, but this was not the case. The mango twigs form a relatively homogenous cover or coating of the pole. In some other cases protruding upper parts are emphasised. At Hasne, however, the upper part of the tree remains tightly bound. Evidently the symbol described in the following marks the contrasting top with its shiny white and highly mobile 'khaushi' fibres. The uppermost symbol called 'Gonda' consists primarily of a circle made of bamboo splinters. It is vertically fixed to a vertical bamboo stalk which protrudes from the top of the leafy part of the pole. In the middle a horizontal bamboo is made to cross the vertical bamboo. It also crosses the circle slightly protruding on both sides. The top and the laterally protruding bamboo ends are marked with large white 'khaushi' tassels. In addition to these three tassels pointing in distinct directions there are others added. In the whole there are about 20 'khaushi'-tassels. They are irregularly fixed here and there or are let to hang down (and move with the wind) on long strings. It is fairly evident that this uppermost part marks strong contrasts in a categorical sense. It is not a cosmic symbolism, the circle and the white bark indicating the skies, it is rather the contrast between top and below and the harmonious implications that provides the deeper meaning. Naturally, in a secondary sense, they can be seen in analogy with heaven and earth. The tassles are strongly white and very light. They easily move with the slightest wind and thus express the harmonious worldview of this local population. At the crossing of the vertical and horizontal bamboo a yellow cloth forms a cussion or a pocket. It contains a sacred sacrifice, called 'roti', sweet food. Those who have understood the deep philosophy of this 'minimum-art' will never again look down on the culture of farming societies. In contrast to urban 'jewelery' which produces endless chains of miserable dependencies, this 'jewelry' is just taken from a nearby tree, and it comes to be placed at the right place where it teaches the villagers of the philosophy of Heraclitus, the great harmony of all oppositions. The arrangement is extremely effective and highly 'sustainable'. Maybe it is the true reason why these peoples are able to harmoniously live in the same spot, in their 'face to face' society for centuries. Note that this is a type of work which makes those who take part very happy. There is a lot of laughing and joking. The Holi pole is finally pushed up using crossed wooden poles. Since the pole is of considerable weight, the process is very slow. The setting up of the pole is definitely also a social event. The pole is very heavy, thus lifting it up with wooden crosses as support is also a quite dangerous thing. It needs a strong communal spirit to do this work. In this sense the pole also respresents the unity of the village and its inhabitants. Most difficult is the last phase when the pole is nearly in vertical position. It still can fall down in various directions. At the same time the earth work is done. Stones are put into the hole to keep the pole in the right position. Finally the hole is filled with earth and this is stamped and hardened. The pole is stable and fixed in the vertical now, its upper part elegantly moves in the evening breeze. The white bark tassels are speaking with the wind. Until the pole is securely fixed it is supported by wooden poles from the side. The lower part shows its blue circular stripes. Towards the evening, when the village pole is erected, the hamlets of the village also start to build their own Holi pole. The hamlet Holi poles are slightly smaller, but have the same structure and show the same symbolism at the top. Suddenly the landscape is enriched by these strange artificial trees here and there. This picture shows the one of Pahliwari, and in the background, the one of Majhliwari hamlet, slightly bent at the top. The Holi pole of Majhliwari. Those who made it are proud. It is an expression of their identity with the place.